Posted in Interview	by Howdy YAL! 1) Radiate is based on your own personal experience with cancer. What made you decide to share your story? When I went through cancer as a teenage cheerleader at the age of fifteen, I didn’t really get what I was going through or why I had to go through it. It’s only been as I’ve grown older and cancer has become a growing problem in our society that I realized the reason I had to have the disease was so that I could share my story with others. That having been through the trying time, the challenges, the disappointments, and the triumphs, I could inspire others who were/are going through the same thing. And not just those people dealing with a deadly disease, but any obstacle in their life that’s holding them back. It’s all about the attitude…and with a good one, you can overcome anything. 2) Throughout reading the book, I couldn’t help but notice that Hayley had positive attitude through ordeal. It’s awe aspiring especially given the circumstances. What made you decide for Hayley to have such a positive outlook on life? Hayley has such a positive outlook because that’s truly how I was when I dealt with having cancer. I attribute a lot of my positive attitude to the fact that I was so focused on being a cheerleader and getting back to practice and my life. Cheerleading literally saved my life. Being able to get on the football field in my uniform and cheer was all I wanted. And at the point where you look at yourself in the mirror and you have no hair left…what choice do you have? You can either curl up in a ball in your room and feel sorry for yourself or you can just move on and move forward. Dwelling on my situation was never an option for me…or for Hayley. It was all about facing the challenge head on and overcoming. 3) You started the Radiate Foundation. Can you explain what the foundation is and how others can get involved? We’re still waiting on all of the official government paperwork, but basically, The Radiate Foundation will be a 501(c)(3) charitable organization that will provide cheer baskets to be delivered by a local cheerleading group to a loved one who is currently in the hospital undergoing cancer treatment. People can go to www.radiatefoundation.org and send an e-mail to join our mailing list. I’m very excited about the foundation and can’t wait to get it up and running! 4) You’ve also wrote a series of books about paranormal ghost hunting (The Ghost Huntress books) what inspired you to write about the paranormal? Actually, I was trying to think up something creative and original in the young adult genre that hadn’t been done yet. I was at the New England Romance Writers Conference in April of 2007 and watched a presentation on “Ghost Hunting 101.” At that moment, I knew I wanted to write about teenage ghost hunters. 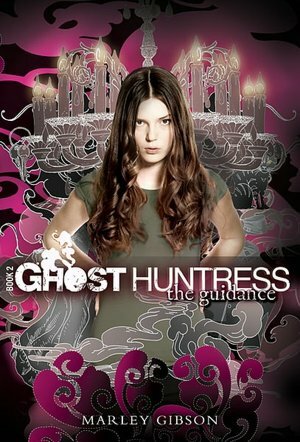 So, I did my research, watched all the TV shows, started attending events, and, in essence, became a ghost huntress myself. I’m now married to one of those TV ghost hunters (Patrick Burns from TruTV’s Haunting Evidence and Travel Channel’s Paranormal Challenge) and we travel around the country full-time doing ghost hunting investigations and events. 5) What was the spookiest thing that ever happened to you during a ghost hunt? I had an encounter with the doppleganger of one of our guests. One minute, she was standing next to me talking and then next, I turned to see her standing about ten feet away from me in another room – even though I had clearly heard her voice next to me and seen her standing there, as well. Scared the patookie out of me! I didn’t scream or anything…I just started shaking and crying like a baby. What? I’m such a girl! 6) Your books take place in the south. What’s your favorite southern dish or recipe? LOL…that’s an easy one. 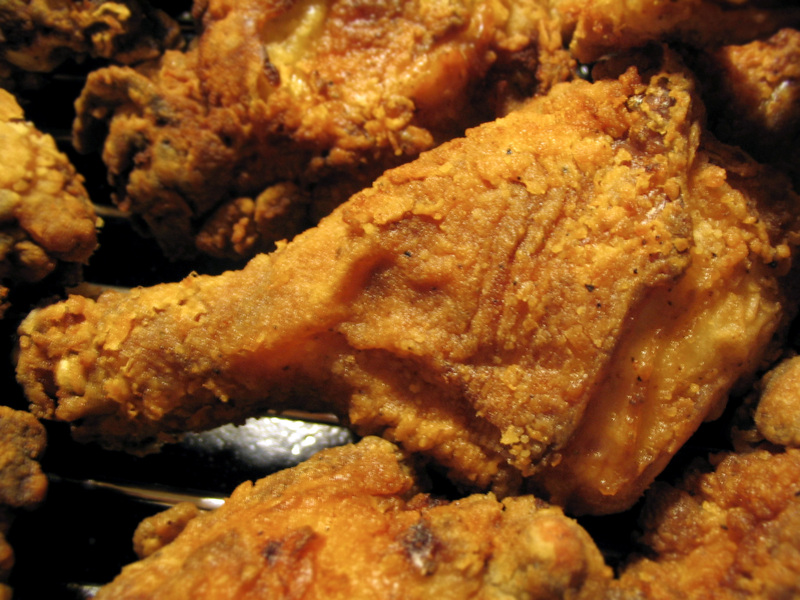 I’m a sucker for fried chicken. My recipe is to soak it for a few hours in buttermilk. Then, roll it in seasoned flour, then eggs, and then a breadcrumb mixture that’s seasoned with all sorts of yumminess. Mmmm…who’s hungry? 7) What sort of music do you listen to when you write? Any specific tunes for Radiate? I usually put on www.m1live.com or www.radiodanz.com when I’m in the blood fever of writing. I adore House/Trance/Techno/Electronica. I always add references to such in my books. For RADIATE, I listened to a lot of cheer dance stations like CheerXM1.com to hear the mixes for cheer dances. Anything with a beat works for me! I would once again like to thank Marley Gibson for this interview. To find out more about Marley and her books check out her website here. 1) Your books involve heavy elements of Greek mythology. For example, Lily’s world was created with help from the sea god, Poseidon. What interested you in mythology? How did using the Greek myths help/challenge you when you wrote Lily’s story? I’ve always loved Greek mythology, ever since I was a little girl. Because it is a major source for the development of Western culture, I feel like it’s an important part of my personal culture. In Forgive My Fins I never intended to use mythology as the foundation for my mermaid world. Only, when I got to the part where I was writing about the source of mer powers, it felt like a perfect fit for them to have originate back with the god of the sea. 2) Your world building skills are amazing, how did you come up with the idea of Thalassinia? When describing Lily’s underwater kingdom, I wanted to make it as believable as possible. The overall structure of Thalassinia is not that different from our own cities, with suburbs, a commercial/industrial core, and the most important building–the palace–in the center. From the outside, the buildings look like the rock and plant and coral seascape you might actually see if you were snorkeling in the Bahamas. I wanted it to be completely plausible that this mer kingdom existed beneath the sea without us even knowing. It was in the smaller details of mer life–what they eat, where they sleep, how they decorate their rooms–where I let my imagination go wild. 3) In Fins Are Forever, we see more of Lily’s human life. What made you decide to focus on this aspect of her life rather than focusing in on some new big sea adventure? When I first got the idea for Forgive My Fins back in 2006, I also thought up two companion stories starring other mer characters. One of those was the story of Lily’s bratty cousin Dosinia doing something really awful that got her exiled onto land. It was supposed to be about Doe struggling to figure out life on land, learning not to hate humans. My publisher wanted a sequel to Forgive My Fins rather than a companion book, so I decided to take Doe’s story idea and tell it from Lily’s POV. Because the story hinges on Doe being exiled from the sea, it naturally had to focus on Lily’s life on land. 4) I see from your website that during the prewriting process you engage in making character collages, can explain how this process works and helps? Here’s how the start of a book usually goes for me. First, I get the idea and I’m so excited about it. Second, I brainstorm a bunch, thinking, daydreaming, making notes. Third, I start writing in a very linear fashion, from chapter one. About 15-30 pages in I get stuck. My writing stalls and I feel like I can’t move forward. That’s usually when I make my collages. I go through a bunch of magazines (Teen Vogue, Lucky, Nylon, People) and tear out images of people, objects, places that remind me of characters in my book. Usually I make collages for each of the main and secondary characters. I’m not sure if it’s the visual interpretation of my story or if it’s my subconscious working as I procrastinate, but either way by the time my collages are done I’m ready to write again. 5) Fins Are Forever starts out with an earthquake. I thought it was interesting that this book discussed the ramifications that natural disasters have on ocean and land. What made you interested in writing on this subject matter and did current events influence the writing of this story? The worst thing was that I turned in the first draft of Fins Are Forever about two weeks after the devastating earthquake in Haiti. I am heartbroken by all the loss and suffering in the wake of these natural disasters–my mom always says that every so often Mother Nature has to show us she’s still in charge–but my use of the earthquake was more for plot development than to address current events in my book. I can’t reveal why exactly without giving a big spoiler, but it became an essential part of the story. 6) Will we be seeing a third book involving Lily? Oh I hope so. I still have that other companion story to tell from Lily’s POV. Fingers crossed that the Forgive My Fins paperback and Fins Are Forever sell really well so my publisher wants more. This fall I start a brand new trilogy about triplet monster-hunting descendants of Medusa. The first book, Sweet Venom, will be out September 6th.